Beijing Sep 14 (IANS) Venezuelan President Nicolas Maduro s official visit to China on Friday resulted in the signing of strategic cooperation agreements in the oil mining economy security technology and health sectors within the framework of the 16th meeting of the China-Venezuelan High-Level Mixed Commission. Maduro said during an address before the Commission that 28 agreements were signed for development of their joint ventures Efe news reported. The agreements signed with Chinese Foreign Minister Wang Yi included a memorandum for share allocation in the Sinovensa oil joint venture as well as a memorandum of understanding (MoU) for development of hydrocarbon joint ventures Petrourica and Petrozumano. An agreement for boosting cooperation between China National Oil and Gas Exploration and Development Corporation and Venezuelan state-owned PDVSA oil and natural gas company was also signed with the aim of exploring and harnessing gas resources in the South American country. The two parties also signed a MoU for cooperation between Chinese tech firm ZTE and Venezuelan Ministry of People s Power for Health. 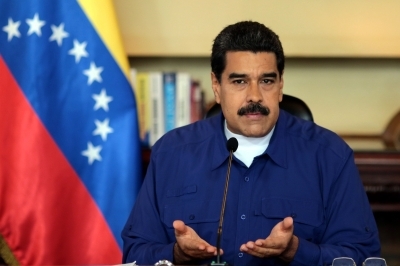 Maduro said the agreements were in tune with the country s economic recovery programme that was rolled out on August 20 and claimed that commercial ties between the two nations had passed the test presented by the global financial crisis. Maduro began his China trip with a visit to the tomb of Mao Zedong founder of the Communist regime in the country near the Tiananmen square in Beijing. Maduro accompanied by wife Cilia Flores paid his respects before the statue of Mao at the entrance to the mausoleum where Mao s embalmed body is preserved. He also signed the visitor s book.